We’ve all been there: an overly full day which results in running out to grab a bagel for lunch. Equally frustrating is buying yummy ingredients for a whopping salad and having to toss it all out at the end of the week because you didn’t have time to prep one each day! Well, fret and fuss no more – with just a little bit of prep time, you can make a week’s worth of lunches that will keep in the fridge! By layering ingredients in a mason jar in this handy dandy order (think 1990’s sand art), your greens will stay green and last for the better part of a week, and land in an appetizing order when you turn it out into a bowl! Pick-up six large mason jars from a store like Canadian Tire. Add dressing to each jar. I use a raspberry vinaigrette, but experiment with favourite dressings to suit your taste. These tough guys will sit at the bottom of the jar in the dressing, so you’ll want to chop and add vegetables like carrots, beets, or peppers to the jar next. Add in smaller, hearty ingredients like chickpeas, beans, corn, fresh peas, use ingredients that will keep your stomach full and happy! The ‘meat’ of the salad – I use cherry tomatoes for the crunch, as un-chopped tomatoes last longer in the fridge! Avocados will brown if left too long; be sure to add them on the day of. Here we add in the savoury side of things – my personal favourite is feta cheese, but tofu, tuna, and chicken are all good options! Top layer – The greens! Top up the jar with your favourite greens: romaine, spinach, chard and more! These healthy gems will keep in the refrigerator for upwards to a week (depending on how hardy your ingredients are) at the ready to feed a Pilates Pro on the go! And last but not least, at lunchtime, shake up your jar and empty out into a bowl. The leafy greens should end up at the bottom with all of the yummy veggies, dressing and cheese on the top. 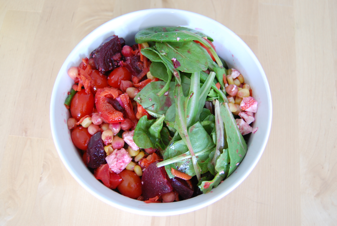 The salad in this picture contained: raspberry vinaigrette, shredded carrots, beets, sliced red pepper, chickpeas, corn, tomato, feta cheese, and mixed greens! Fuel that engine and enjoy! Kate fell in love with Pilates more than 15 years ago and decided to turn her passion into a career. She is now one of BODY HARMONICS leading instructors and has a very full schedule. Kate not only draws on her past experiences in Theatre and Film to devise creative class plans, but also to get out-of-the-box in the kitchen making meals with her husband Dirk.